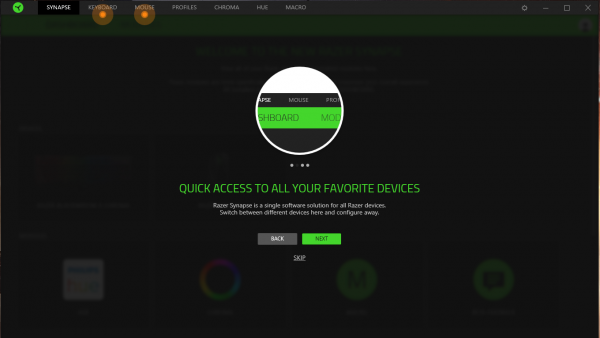 As with most modern Razer peripherals, the Razer Basilisk utilises the Razer Synapse software suite for its driver and configuration tool. 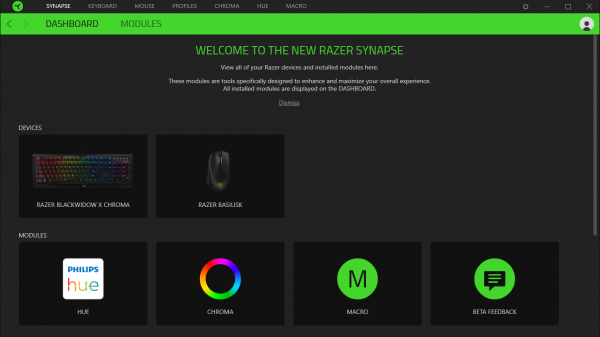 Razer Synapse 3 has received a makeover since version 2 and one of the key features is its support for ‘hybrid’ Synapse devices (such as the Razer Basilisk we are reviewing today) that allows for profiles to be created and stored on the cloud (as you could with Synapse v2) but also stored locally on the device’s on-board memory so that key customisation, macros, lighting configuration, sensitivity, etc can be transferred to another system without the need for additional installations. 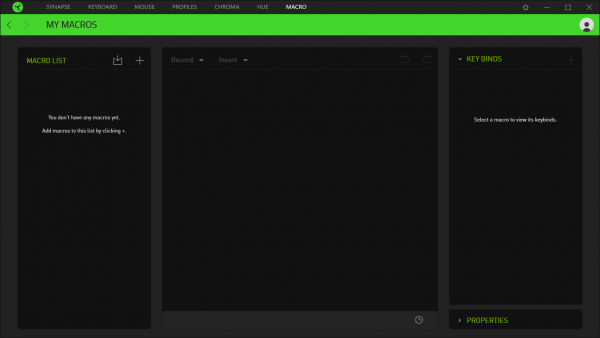 Razer Synapse allows you to create an account, login and save all your configuration to the cloud. 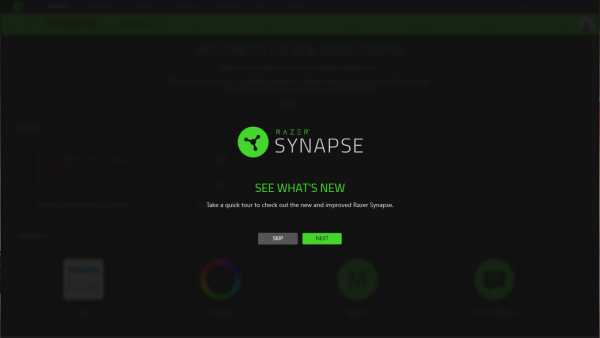 If you were to lose your OS / upgrade your PC / login to a different PC with Razer Synapse installed (e.g. 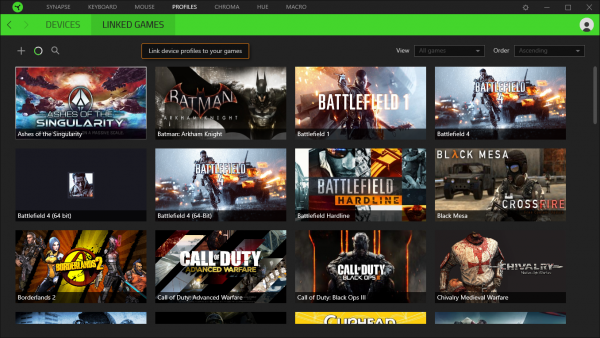 an internet gaming cafe for example), all your configuration is instantly retrieved and applied to your device(s). 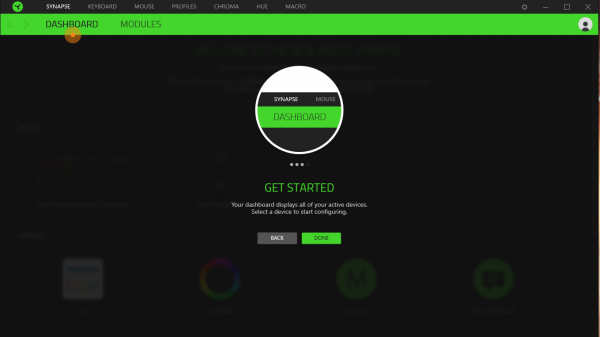 So, without further ado, let’s take a look at the various menus available to the Razer Basilisk in the Razer Synapse v3 beta software. 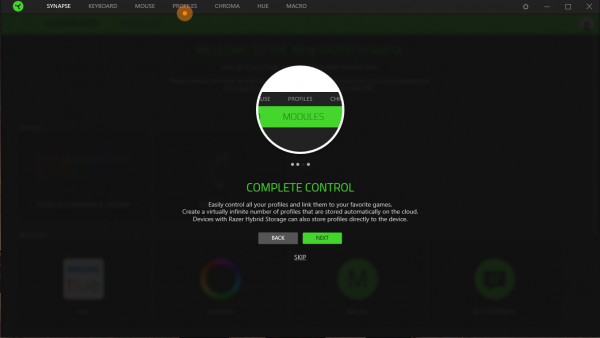 Under the Mouse -> Customise tab, the Razer’s Basilisk’s buttons (left, middle, right, scroll wheel, sensitivity up / down buttons, two side buttons and clutch) can be re-configured as you choose. For example, you can bind the two ‘sensitivity stage up/down’ buttons to another function (if you don’t frequently use these) to keyboard presses such as F11 and F12 so that you can use these as extra bindings in games. 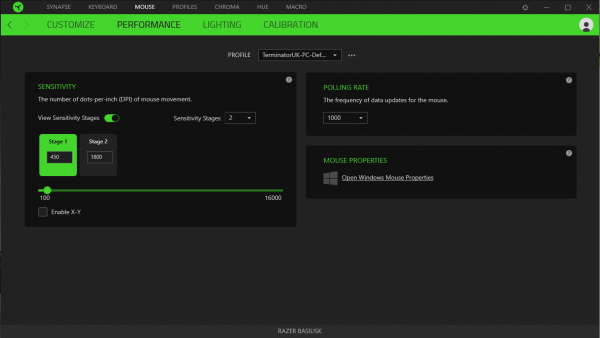 Moving to the all-important Mouse -> Performance tab, the sensitivity, acceleration and polling rate can all be configured. In addition, you can even un-link the X and Y sensitivity to have different sensitivities on your vertical and horizontal movements if you wish. 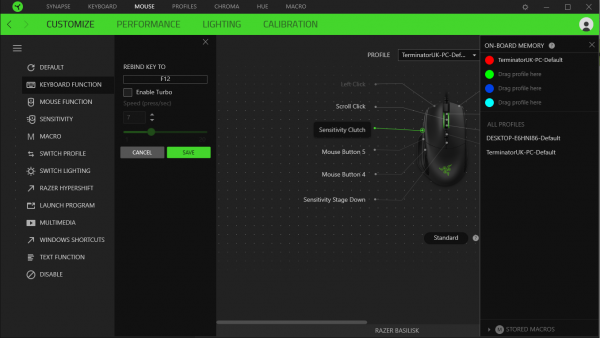 Heading over to the Mouse -> Lighting section should be on the agenda of every case modder out there. 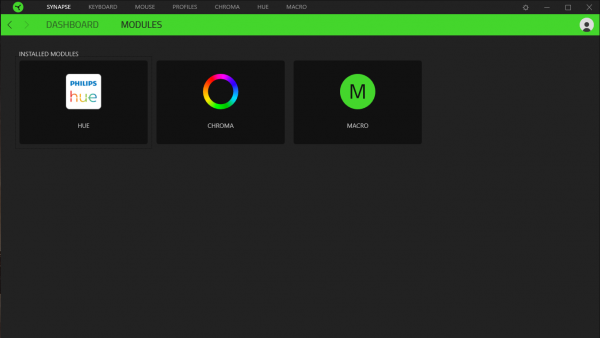 As with most Razer Chroma devices, the level of lighting customisation available to the Razer Basilisk does not disappoint. 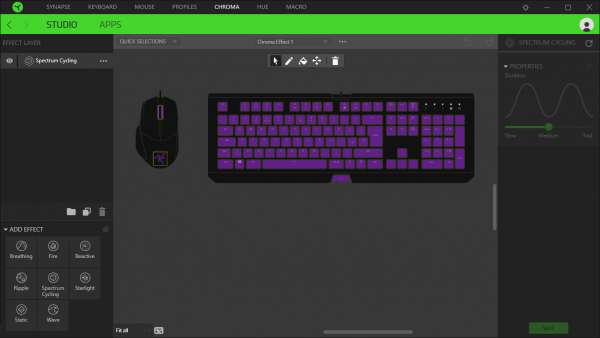 As with some other advanced Razer mice (such as the Razer Diamondback) the Razer Basilisk has the ability to utilise fully customise its RGB lighting scheme. 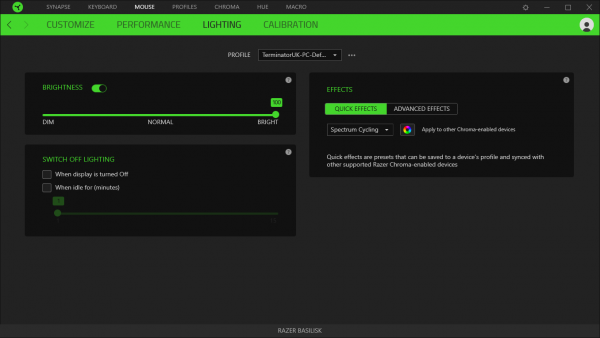 However, in the case of Razer Synapse v3, this has now been consolidated into a new section called Razer Chroma Studio (accessible by clicking on the ‘Advanced Effects’ button in the screen above or going to Chroma -> Studio from the top tabs) allowing for a virtually unlimited amount of customisation effects to be applied across your entire range of Razer peripherals in one convenient section. 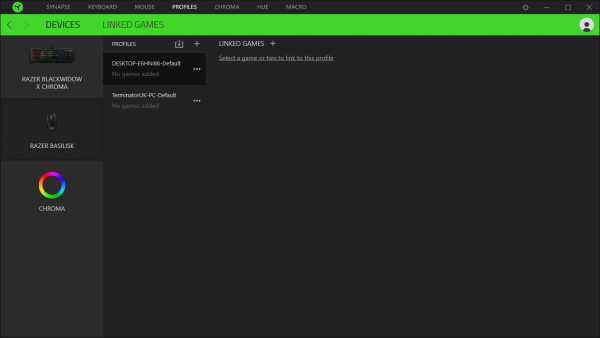 The next sub-tab under the Mouse menu is the Mouse -> Calibration menu. 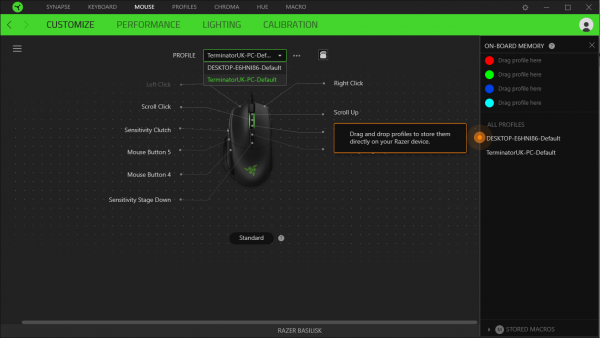 This section of the Razer Synapse software allows you to calibrate the mouse to either a pre-defined set of Razer mouse mats or to set it up against your own mat. 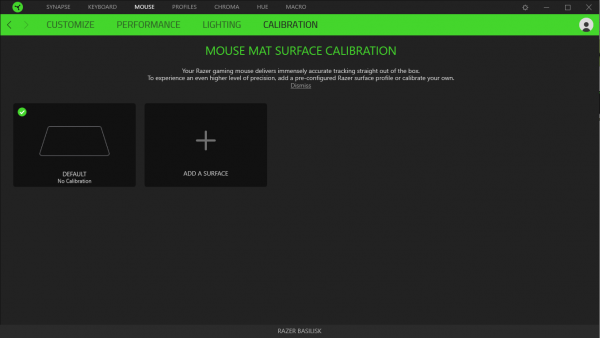 In addition to the sensor calibration, you can also configure the ‘liftoff range’ which determines the distance away from the mouse mat that the sensor will stop tracking when you lift and replace the mouse towards the centre of the mat (which can be useful to reduce the unwanted tracking associated with lifting the mouse). 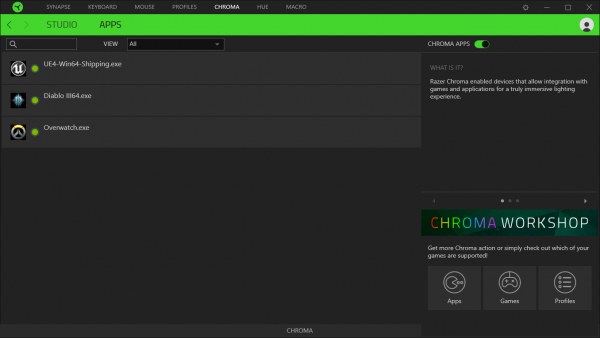 Under the Chroma -> Apps section, a list of Chroma-enabled games with specialised effects can be found. 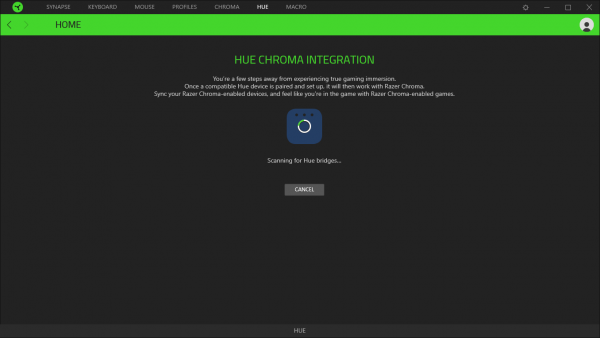 The Chroma Apps section is a very interesting feature which allows you to integrate your device with ‘profiles’ that the game developer has created for Razer to distribute with their games. 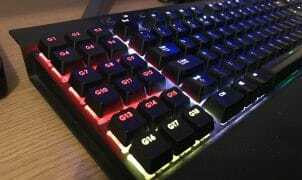 For example, if you play Overwatch, your Chroma devices will change colour to the hero you have selected (e.g. Red for McCree, Pink to Zarya, etc), certain keys (like ‘H’ to switch hero) will pulse when you are in the spawn and there is a ‘flash’ sweeping effect when you are on the hero selection screen.